L’Aubenuit owner-patissier Lim Ho-yeon patiently waited for the opportunity to serve his patisserie’s namesake dessert. “This was something I had in mind when I was in France,” Lim, 30, said. Lim was in France for six years. Before France, Lim studied Korean cuisine in college. He then started to develop an interest in desserts. In 2011, he decided to delve further into the realm of sweets, traveling to France to study dessert at two schools. 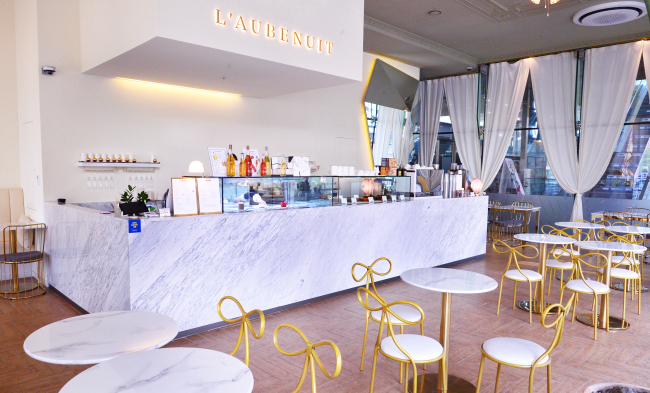 Fast forward six years to Lim’s return to Korea and the launch of L’Aubenuit -- a spacious patisserie with gold and marble accents and floor length windows -- in Sinsa-dong in Seoul this May. With the launch came the cake that Lim had been waiting to serve. 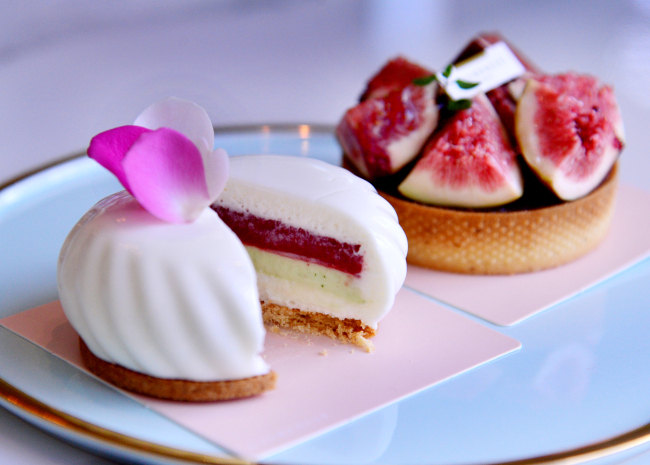 Christened L’aubenuit, this confection is an elegant marriage of strawberry and basil. For the base of this cake, Lim and his team sent a nod to a regional dessert from Anjou, France. Called cremet d’Anjou, this sweet is traditionally crafted with cheese. Lim and his team use yogurt instead, creating a soft, creamy mousse-like orb that swaddles a layer of sweet strawberry coulis and a layer of ganache made with white chocolate and basil. A sturdy, buttery and slightly salty sable cookie acts as the foundation to this delicate, fragrant dessert, adding a crisp, crunchy texture to the mix. With A’ demain, a seasonal dessert that Lim and team released this fall, figs are iterated as a dried fig and red wine paste and as fresh figs in a tart. This tart derives its charm not only from the rich dried fig paste and velvety fruit, but also from its almost eggshell-thin tart shell, which is as crisp as a cracker. Moist lemon genoise -- a sponge cake -- and an Earl Grey ganache add fragrant dimension to this complex autumnal treat. This fall, Lim and team are also serving their take on the Mont Blanc -- a popular dessert customarily crafted with chestnut puree and whipped cream. At L’Aubenuit, their variation, simply called Marron, features an outer layer of strands of rich chestnut puree around whipped cream infused with chestnut, almond mousse and Swiss meringue. A cap of meringue and a bit of sweet chestnut tops the cylindrical confection. “We serve it ice cold,” said Lim, who added that this dessert is only available in-house and is meant to be enjoyed like ice cream -- one cold, creamy bite at a time. 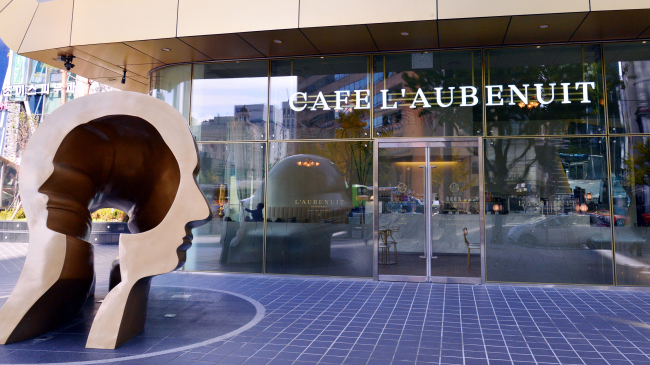 L’Aubenuit also offers a selection of pound cakes, madeleines and caneles. Lemon madeleines are soft and moist, while the shop’s CoCo Passion, with its fine coconut milk-infused crumb, its jammy outer layer of passion fruit syrup and dusting of sweet, very fine shredded coconut is a toothsome pound cake option for several to share over coffee or tea. Lim stressed that all these creations are not his alone but a collaborative team effort. “We work together,” he said.